Welcome to another tuesday review after MNFC’s summer hiatus! Whilst the kids are returning to school this week, and the MPs return to Westminster, what really interests Londoners is “what does the next instalment of MNFC have to offer?”. Well, fear not film fans. We were in for a treat on monday night with a trip to Kew Gardens and Comrade Lisa’s first time of hosting! Traditionally, new-comers to MNFC tend to do very well in the FAFTA’s, and I have a feeling this evening will not be an exception. Because not only were we treated to themed food (delicious Cuban Pork… when it turns out that hotdogs were also featured strongly in the film and would have proven much easier to make!) and a fantastic film screening linked to the dinner, The Station Agent. Lisa chose this film as it was one of her favourites, and it is very clear why. It follows the story of Finbar (Peter Dinklage), a train enthusiast, who inherits an abandoned railway station in rural New Jersey. 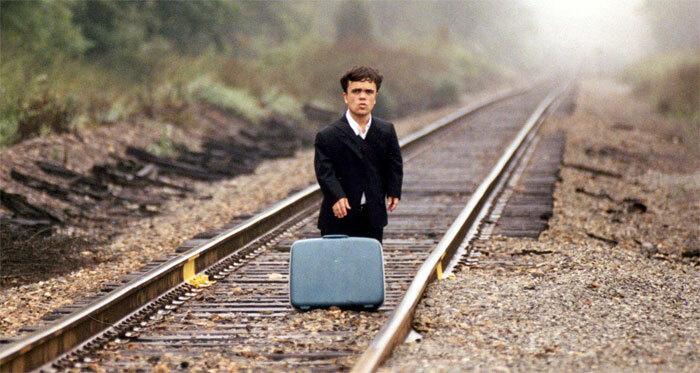 Finbar has achondroplasia, and tired by the stigma of his condition decides to move to the station for isolation. However, he quickly meets Joe (Bobby Cannavale) and Olivia (Patrician Clarkson) and despite his best intentions finds himself tangled up in their personal dramas to the point that he becomes emotionally involved. It’s only when these newly forged bonds are tested that he finally opens his eyes to a broader view of the world, and his place in it. Directed by Tom McCarthy, this brilliantly funny and heart-warming film is a great demonstration of American independent cinema and how much can be achieved with a top script, a small budget, and a first-rate cast. Mark Kermode has said it is one of his favourite films of the 00’s, and the film’s official website shows the vast number of awards it picked up. In visual style, trendy soundtrack and deadpan humour it evoked other American independent films of the MNFC back catalogue, such as Lars and the Real Girl, and The Kings of Summer, and in it’s subject matter brought to mind comparisons with Into the Wild (with it’s main protagonist seeking isolation in small town America), and Les Intouchables (in it’s portrayal of disability). It is this last point that particularly interested me as I watched the film. Many of the problems Finbar had in The Station Agent were not directly related to his dwarfism, but by the stigma (perceived or actual) he experienced by others. The main character in Les Intouchables was clearly very limited in his abilities and his disability was one that had to be overcome in many ways. But, I wonder, had Finbar been born into a more accepting society would his short stature have been a challenge in the way it was portrayed in The Station Agent. Gladly, perceptions of disability are changing all the time in the UK, helped in part to a very successful Paralympic Games in 2012, and some high profile athletes and celebrities. Peter Dinklage himself has become very well known since his break-out performance in The Station Agent, through his casting in Game of Thrones (MNFC’s second foray into Westeros, after Nikolaj Coster-Waldau in Headhunters). In this great interview he describes some of the personal experiences he has faced in view of his achondroplasia, the challenges of being cast as a romantic lead in The Station Agent and how Hollywood has a long way to go in it’s portrayal of people with disability (again something which Les Intouchable‘s tuesday review touches on). His supporting cast is in equal measure excellent, and the characters of Joe and Olivia contrast brilliantly with Finbar’s deadpan. Patricia Clarkson was described by Lisa as “the best thing in everything in a really understated way” – so much a strong character actor that we’d even forgotten she was in the last MNFC film shown, Lars and the Real Girl! And also Bobby Cannavale, who surprisingly makes a memorable appearance in the opening number of 2011’s Tony Awards (around 4:00min on this YouTube video but I’d recommend watching the whole thing for all round awesomeness)! And finally… with this film being all about trainspotters (and not the “choose life” kind), if it has sparked a desire to find out more you’ll not be alone, and click here for details. There’s even scope for the new generation of MNFC here too! So, if I don’t see you with your clipboard on the platform of Clapham Junction, then I’ll see you at the next MNFC where we will be all aboard the express service to Streatham and Chez Susan on 22nd September. Bloody love this film. More films should be about random people making friends with each other. Also Patricia Clarkson running him off the road twice is hilarious.